This man was recently referred to us like how you pass on a family secret. Like passionate locksmiths or shoemakers that customizes for celebrities, such crafts have to be celebrated amid the onslaught of instant gratification brought about by the impulsive retail market of modern times. Nothing feels, fits, and makes one hell of a statement better than a custom-made apparel. A tailor to many a satisfied customer, Peter Ng of HK Broadway Tailors are one of those people that made Hong Kong famous for those one-day custom-made tailor fit suits. Yes the craft is still alive and kicking. But with an influx of other nationalities and people trying to make a quick buck by alluring you with their flashy suits along the streets of Tsim Sha Tsui, it becomes harder and harder to find those that still do it well. How can Peter’s craft be vouched? Well, aside from Trip Advisor reviews, one way was to have one made. And what a perfect opportunity than with a recent 36 hour Anthony Bourdain-like episode of The Layover in Hong Kong. With just about 36 hours to use in Asia’s true world city, one can make the tailor shop your first stop, and your last one before you take the MTR and Airport Express back to Hong Kong International Airport. Arrive at his shop at noon, have yourself fitted, and bargain to have your first fit by 5pm of the same day. Say that you need the suit before you leave by tomorrow, bargain to have it done by 3 in the afternoon, in time to take the train for a 6pm flight. If you want them to take their time, they can ship it to your address abroad, too. Of course, such rush things do have tradeoffs. If you are not sure how you want the suit to fit you, there can be some delays in having it fit. Also, rush jobs don’t come cheap. They can range from HK$ 3,000 to 5,000 depending on fabric and complexity. In the case of Peter’s, ask him to go a bit easy on the shoulder padding as he tends to put in a bit more (unless Zoot Suits are your thing). The ideal scenario is if you have a suit of yours that fits well, ask him to cut it along those specs. It’s a one-of a kind experience, and nothing leaves a satisfying smile than having something made just for you. Hong Kong’s one-day tailors will never go extinct, but you really just need to know where to look. One thing’s for sure, look no further than Peter Ng’s HK Broadway Tailors. 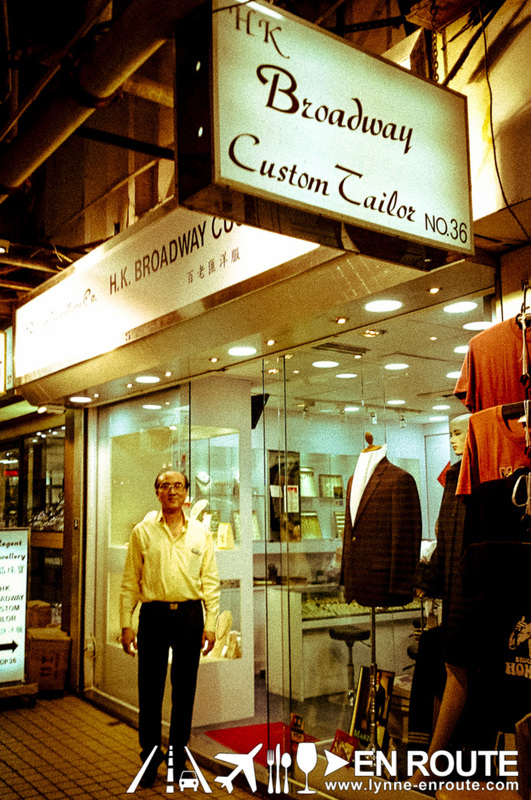 HK Broadway Custom Tailor is located at Shop No. 36 (used to be located at Shop No. 49), G/F Mirador Arcade, #58 Nathan road, Tsim Sha Tsui, Kowloon, Hong Kong.